, fifth baronet of the family, and first earl of Egmont, was born at Barton, in the county of York, July 12, 1683, and received his education at Magdalen college, Oxford. 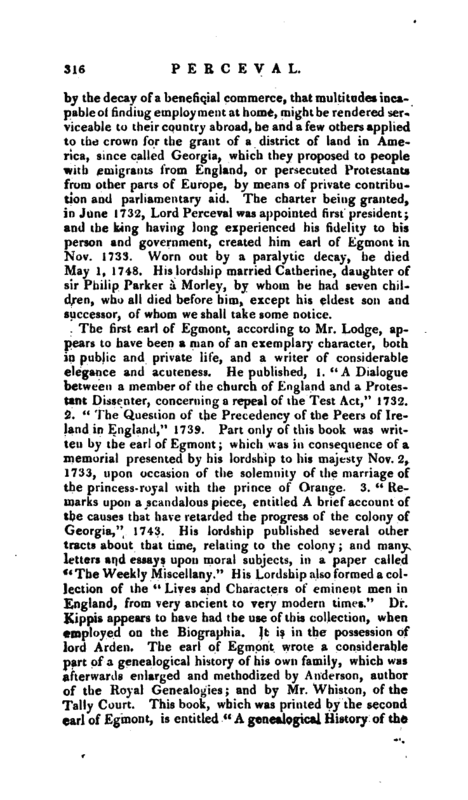 On quitting the university, in June 1701, he made the tour of England, and was admitted F. R. S. at the age of nineteen. Upon the death of king William, and the calling of a new parliament in Ireland, he went over with the duke of Ormorid, and though not of age, was elected for the county of Cork, and soon after appointed a privy-counsellor. In July 1705, he began the tour of Europe, which he finished in October 1707; and returning to Ireland in May 1708, was again, representative for the county of Cork. In 1713, he erected a lasting monument of his charity, in a free-school at Burton. 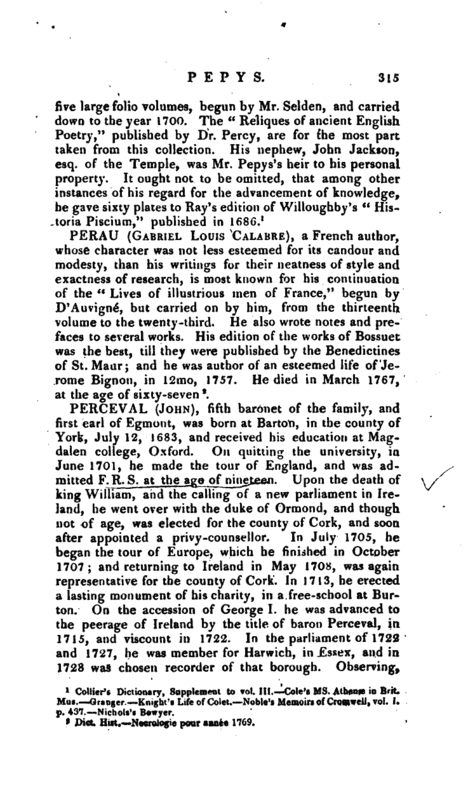 On the accession of George I. he was advanced to the peerage of Ireland by the title of baron Perceval, in 1715, and viscount in 1722. 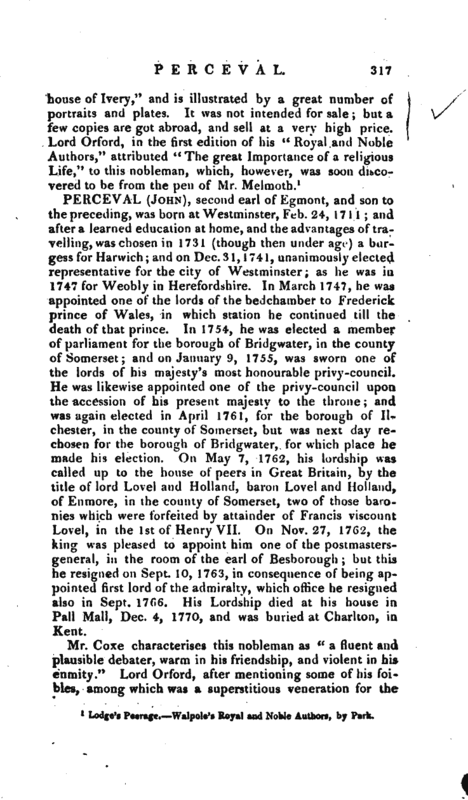 In the parliament of 1722 and 1727, he was member for Harwich, in Essex, and in 1728 was chosen recorder of that borough. Observing, | by the decay of a beneficial commerce, that multitudes incapable of finding employment at home, mightbe rendered serviceable to their country abroad, he and a few others applied to the crown for the grant of a district of land in America, since called Georgia, which they proposed to people with emigrants from England, or persecuted Protestants from other parts of Europe, by means of private contribution and parliamentary aid. The charter being granted, in June 1732, Lord Perceval was appointed first president; and the king having long experienced his fidelity to his person and government, created him earl of Egmont in. Nov. 1733. Worn out by a paralytic decay, he died May 1, 1748. His lordship married Catherine, daughter of sir Philip Parker a Morley, by whom he had seven children, who all died before him, except his eldest son and successor, of whom we shall take some notice. 1 Lodge’s Peerage. Walpole’s Royal aud Noble Authors, by Park.